The Danieli palace was ordered built by the Dandolo family at the end of the 14th century. Four members of this noble Venetian family became doges: Enrico, sponsor of the 4th Crusade and two in the 13th and 14th centuries who greatly expanded Venice’s prestige. The fourth doge, Andrea Dandolo, was a patron of the arts who greatly beautified Venice. Marriages and successions over the centuries caused the floors of the palace to be divided among several owners. In 1822 Giuseppe Dal Niel and his adoptive daughter bought two floors of the palace and transformed the property into the Danieli Palace Hotel. As being one of the grand palace hotels of Venice, the Danieli is open to microscopic reviews. And perhaps it should be for the prices you pay here. The Danieli has a fabulous location and a to-die-for view from the restaurant. Be warned though: drink and food prices are outrageous. If you want to stay in a historic room, opt for the 14th-century building. These rooms can be a bit noisier as compared to the new building, but you’re paying for the ambience. The Danieli is located right on the Canale di San Marco. 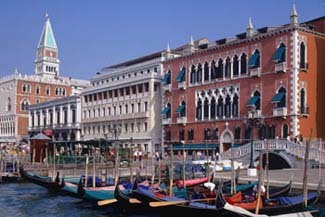 A vaporetto stop (direct to the train station) is located in front of the hotel. The stop is San Zaccaria (St. Mark’s Square). Parking for the hotel is at the Piazzale Roma. The hotel will also meet and greet guests at the cruise line dock, airport, or train station. Reception at the hotel. Can arrange for a ceremony off site. Inquire hotel for details. Sumptuous is the word that comes to mind when you stand in the Danieli’s magnificent lobby. Silk-covered walls and a grand Venetian-arched and balustraded staircase glow in tones of gold. Gilt furniture, sparkling Murano chandeliers, painted ceilings, mirrors, and stained-glass windows suggest luxury at every turn. Guest rooms can be located in three different buildings that are connected by inside corridors: the original Dandolo palace, a 19th-century building, and a new structure. Rooms in the old palace may be on the small side (including bathrooms), but they are the most historic. Among the long list of celebrities who have stayed here—Goethe, Wagner, Charles Dickens, and Elizabeth Taylor—the room occupied by George Sand and Alfred de Musset receives the most requests.